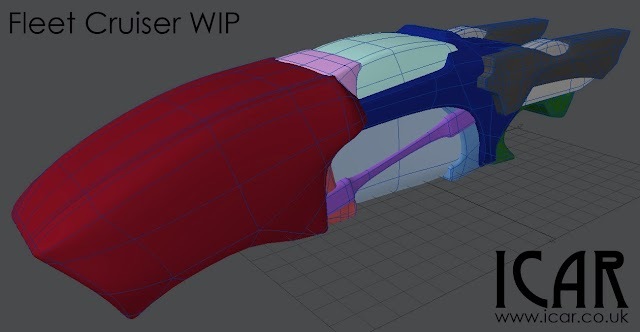 I'm modeling the Fleet Cruiser at the moment. It is an emotive model because I've been drawing Fleet spacecraft since I was 14 and I've never been 100% happy with any of them. I know what I want it to look like in my head: a mix of curves and sharp lines. I think I'm getting there with this one. The model is not finished, there needs to be more pieces put in at the back and there needs to be way more detail before I begin surfacing. Hopefully by sharing, it will keep me spurred on to finish it! The base shape is cool, I think it really needs a lot of fine structures to give the impression of size. Otherwise it's basic form appears to be at the same scale as the smaller cargo ships.